It wasn’t that long ago that mussels were virtually unknown in the U.S. outside of a few ethnic markets in the Northeast. But aquaculture and a good marketing job by mussel producers have made mussels one of the seafood industry’s great success stories. Today, Americans have a world of mussels to choose from. Green shell mussels from New Zealand, blue mussels from Maine or Prince Edward Island, Mediterranean mussels from Washington state—our appetite for this marvelous mollusk is growing by leaps and bounds. Most mussels are raised on farms and have earned a green Best Choice rating from the Monterey Bay Aquarium Seafood Watch. With a distinctive rich, sweet taste, like a blend of oysters and clams, mussels are perceived by many chefs and consumers to be gourmet seafood. 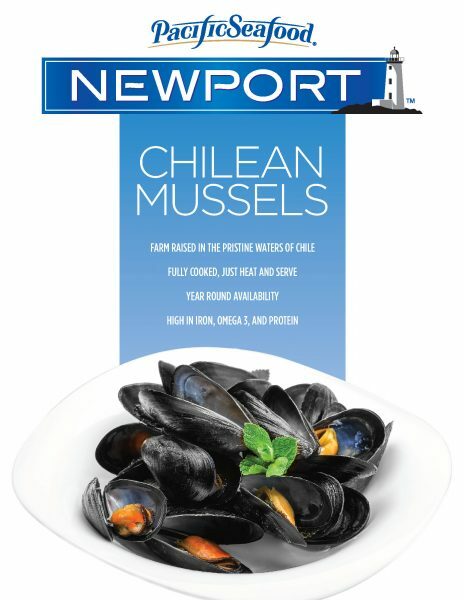 They are a very healthy seafood high in protein and are a great way to add perceived value to shellfish dishes such as cioppinos and paellas, or served steamed as an appetizer with some nice crusty bread.